General Glen McMahon (Brad Pitt) has been given an impossible mission - to get the job done in Afghanistan. Everyone knows that this mission will fail - everyone except him. For what can you do when the war you are fighting just can’t be won in any meaningful sense? In War Machine, Brad Pitt plays General Glen McMahon - a character loosely (very loosely) based on US General Stanley McChrystal, a man who, in 2009, was tasked with ending the US military involvement in Afghanistan. David Michôd’s film is based on a book (which was itself based on an article in Rolling Stone) by reporter, Michael Hastings. 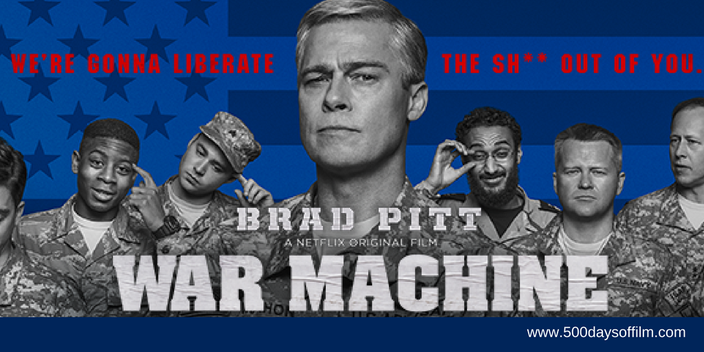 War Machine features a truly stellar supporting cast - alongside Brad Pitt we see Ben Kingsley (as President Karzai), Meg Tilley, Topher Grace, Will Poulter, Emory Cohen, Scoot McNairy and Tilda Swinton. Sadly, despite these (and other) impressive names, War Machine fails to engage. The film is tonally uneven - unable to decide just what it wants to be and ending up falling somewhere between broad comedy and biting satire. While there are laughs to be had and the ridiculousness of the military situation is clear, neither tone hits home and the film feels unsatisfying as a result. inconsequential given the state of the global political landscape today. Brad Pitt’s portrayal of General McMahon is genuinely bewildering. I found his performance jarringly cartoonish and utterly distracting. Meanwhile, the incessant narration by Scoot McNairy's Sean Cullen is hugely irritating - particularly as he is made to over-explain everything and everyone. Netflix Original Films have been subject of much debate in recent weeks and I have enjoyed many of them. It is such a shame that War Machine (arguably its highest profile movie release thus far) has missed the mark. Have you seen War Machine? If you have, what did you think of this film? Let me know by leaving me your thoughts in the section below.